Skulls And Kisses | UK Lifestyle and Alternative Fashion Blog. : Top 6 films of 2012..
Top 6 films of 2012.. So as promised at last my favorite films of the year. I have my book posts to finish before Tuesday too and I need to do my review of the year and post a Christmas post. I've been super busy or it would have been done by now, sorry guys. Oh how I excited I was to see this! I was excited about the Hobbit though because it was so much more interesting and exciting than Lord Of The Rings, it was a happier novel and much easier to read. The film was the same, much more upbeat. I enjoyed it so much I can't describe it. Although I'd read the book and knew what to expect, I was still worried about the dwarves and Bilbo and Gandalf. I can't even describe how amazing Martin Freeman was in this to be honest, he was just absolutely fantastic. To me he is Bilbo Baggins, he plays the part so well, just as I imagined Bilbo, I can't praise him or the film enough. Yeah ok so there is loads left to be seen and it doesn't have as much action as Lord of The Rings but it's definitely fantastic. It's my favorite film of the year and Batman was pretty hard to beat. The last in the Dark Knight Trilogy, I was so sad when I heard this would be the final installment of Nolan's. I've been a Bat fan since I was about 8 I think, I used to watch the Cartoons and I loved the 80s Tim Burton films with Michael Keaton. Then there was a couple of 90s batman's which were so bad they were good, then come Nolan's Triology. Oh how I loved batman begins and then there was the poor dark knight but this really brought it back for me. The effects were amazing and the casting was fantastic, the plot twists and turns and I have so much love for it. The drama and the shock, I was on the edge of my seat through out the whole film! 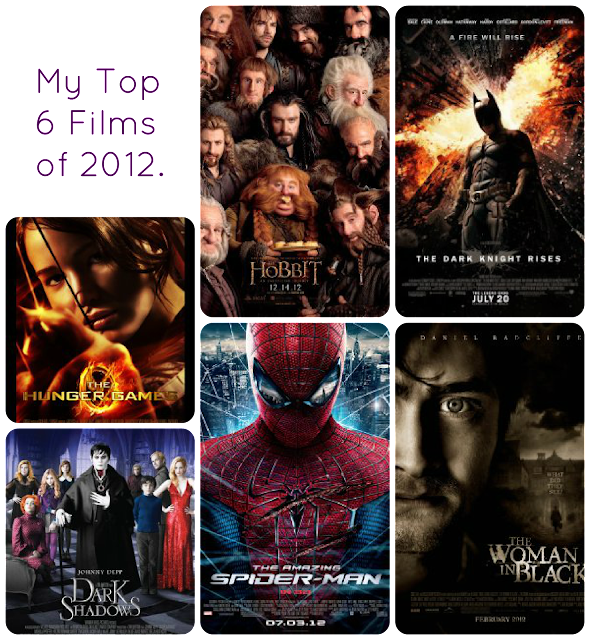 Much better than the Dark Knight but I cannot decide which I like more Batman Begins or The Dark Knight Rises. I love spidey, the film was fantastic. Although I think I spent the majority of it perving on Andrew Garfield because he looks fantastic as Spider man seriously girls just watch it for that. Emma Stone was also great as Gwen Stacy, I'm pleased the producers brought in Peters first love interest instead of boring old Mary Jane ( I really don't like her.) The graphics were great too, there isn't much I can say about spidey really apart from it was awesome because I'm not as passionate about Spider man as I am about the previous two films so really, it was very good I suggest you all watch it. Now this was a first, a film that was better than the book. Oh how I laughed and took the piss when I saw the trailer. Oh look Daniel Radcliffe in a horror, it looks a little scary but oh it won't be that bad with him in. How wrong I was. John had nail marks in his arm, the film itself a ghost story is not scary it is the suspense, the waiting for something to happen. The worst bits were where you're sat waiting and waiting and when it happens its not scary so you relax and then BANG its there scary and you have a mini heart attack. If you want a film that is jumpy and gets your heart beating this is one for you. Its a classic ghost story, the book was such a let down no where near as scary. Oh how disappointed I was with this film, I read the Hunger Games trilogy what seems like an age ago, yet it was only back in early 2009 and the reason I picked it up was because Stephen King had rated it. I soon got it read and counted the days for the next book and got excited as there were rumors about a film. Alas it was poor. It was nothing like I imagined it, the book was more gritty and I loved the politically under story, I felt that the film focused too much on before they were in the arena, I'd have liked to of seen more arena action. The book was great but the film I didn't enjoy it as much as I had hoped. I'm not sure I'll bother seeing the next two films since the books weren't as good and well the films are always a let down. I mean I enjoyed it but I felt it didn't do the book justice, if you ignore the book and focus on the film though its brilliant. I'm a massive Tim Burton fan but this was just an odd film really. I really enjoyed it but I still have no idea what it is meant to be, is it a comedy or a horror or what? It was a mixture of everything. I would say its a good pick me up or one of them films to watch when you want something light hearted that you don't have to concentrate on. I really enjoyed parts of it and other bits I was thinking hmmm when is this due to finish? But my favorite part has to be when Alice Cooper is on, oh that made me very happy.